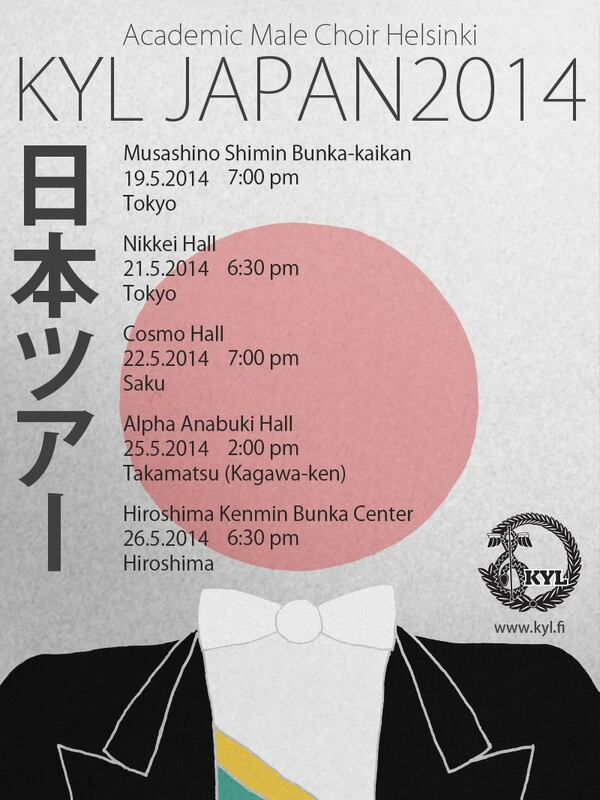 Helsinki Academic Male Choir KYL visited Japan between the 16th and 28th of May 2014. During the tour the choir visited Tokyo, Saku in Nagano prefecture, Takamatsu in Kagawa prefecture and Hiroshima. The tour program consisted of five concerts. The tour aimed at promoting Finnish culture, education and business in Asia. KYL co-operated with various companies and other institutions. “Of course, our cultural goals are on a very high level. But as we have worked really hard in order to make this tour happen we must not forget the fun side either. The right balance between our core business – that is providing our listeners with exquisite musical experiences – and relaxation is of utmost importance” said Jussi Suominen, the President of KYL. Japan was a highly interesting destination for KYL: Finland and Finnish culture are well-known phenomena, and Finnish choirs are frequent visitors in Japan. This was also reflected in the concert programs. Some of the key compositions by Finnish masters like Jean Sibelius, Toivo Kuula, Leevi Madetoja and Einojuhani Rautavaara became familiar, but the choir had not forgotten its ambition to perform more international songs either. Indeed, concert visitors had also have a brilliant opportunity to enjoy music by Hugo Alfvén, Edvard Grieg, Ko Matsushita and Michio Mamiya, for example. Previously KYL had visited Japan in 1988. The choir’s latest long concert tour took place in the USA and Canada in 2010. The tour’s kick-off concert was held in Suvilahti’s Kattilahalli (Helsinki) on Wednesday the 7th of May at 6:30 p.m.